Sunday morning I was up way too early. 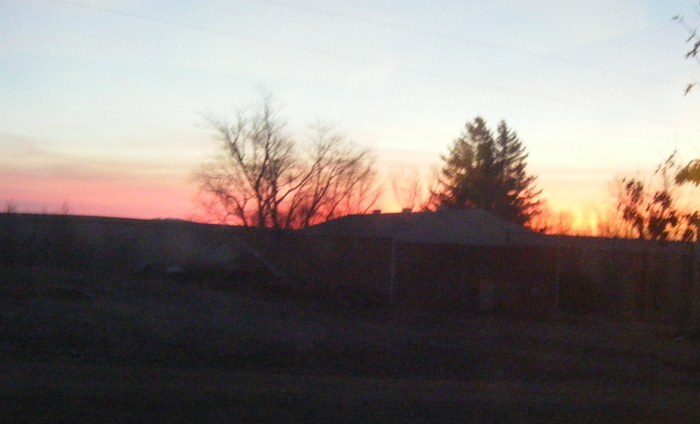 As I headed back to bed, the sunrise was deafening! Bright red, not so wonderfully captured by my camera. Plus I refused to go outside as I’m sure it was in the 20’s at best. 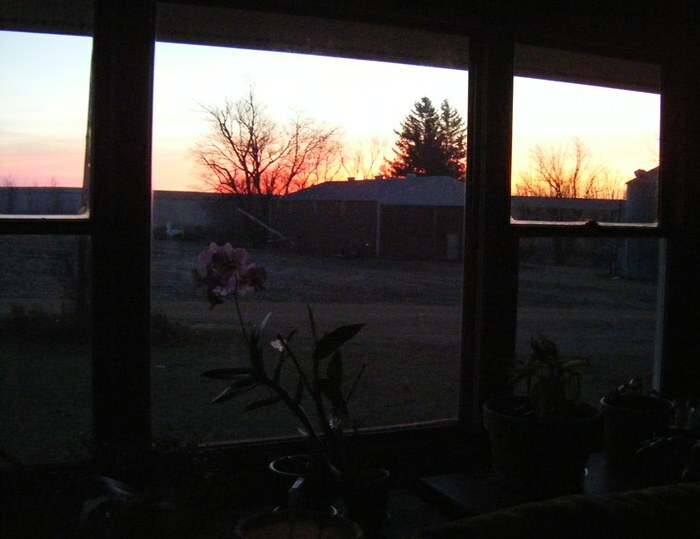 That afternoon while I was downstairs sewing, JP called for me to see the sunset. 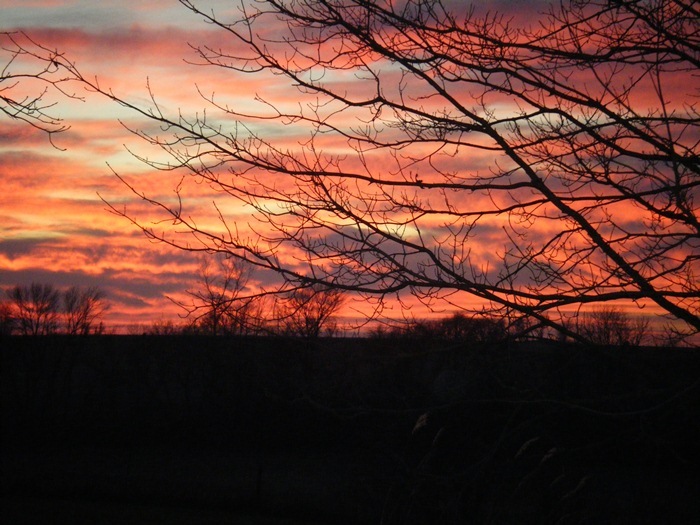 So what does a red sky in morning AND a red sky at night say? The sailors must be confused! I have the LaPetite project done for November. This month I was only able to submit a completed top but not a quilted wallhanging. By the time the pattern arrived in mid-November, there was a ton on my plate!! Because I wasn’t thrilled with the pattern, I chucked my original plan of fabrics I had purchased on my Madison trip in September. Instead I raided my charm stash. At quilt guild, I’m in the charm square exchange. 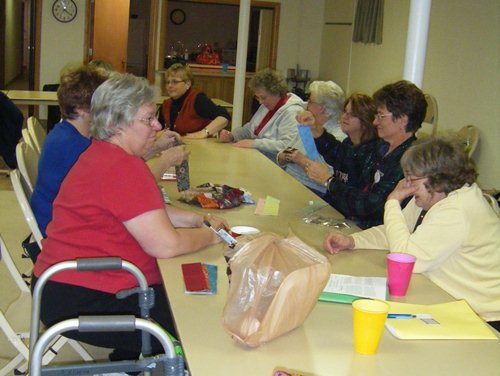 Each month we bring a pair of 5″ squares per person in our group following the color for the month. This is my collection. I think I’ve been in the exchange for 3 years. 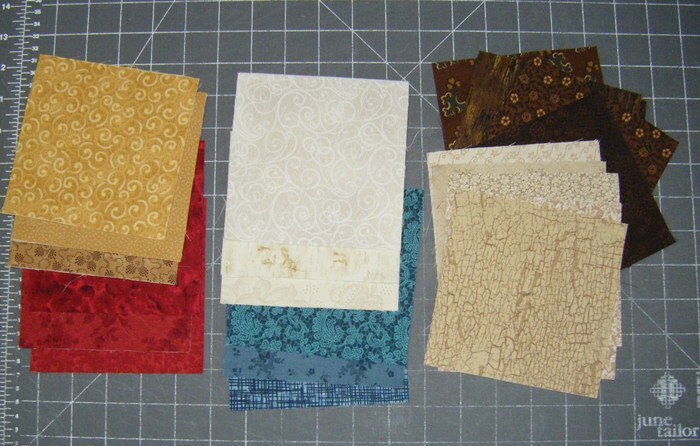 To make choosing easier, I kept with the basic colors of the pattern and chose these charm squares from my stash. 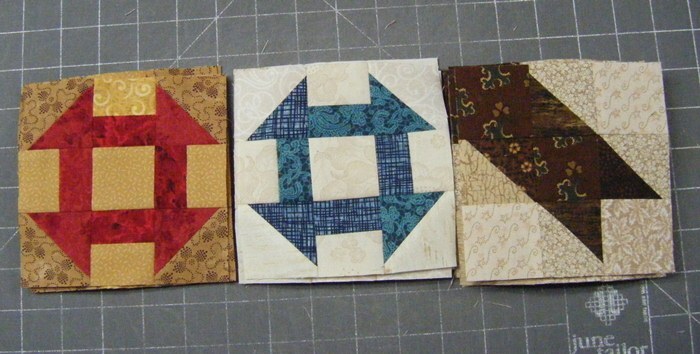 I made the inner churn dash blocks first. Mostly to get the red over with! 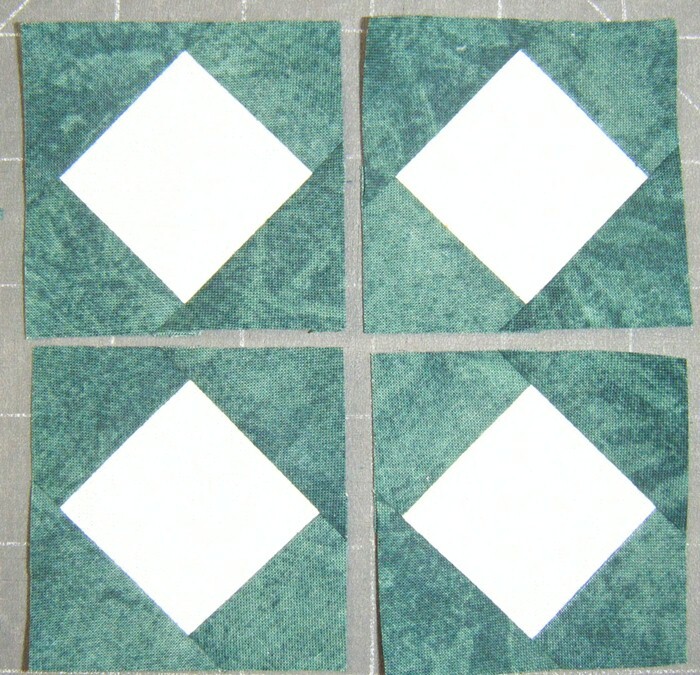 🙂 I then redid how I’d do the other blocks as I’d rather make half-square triangles with 2 1/2″ blocks and trim them up after sewing. So my red ones are sort of wonky…. It is always fun when Phil has a day off (so to speak…) and both kids are home. 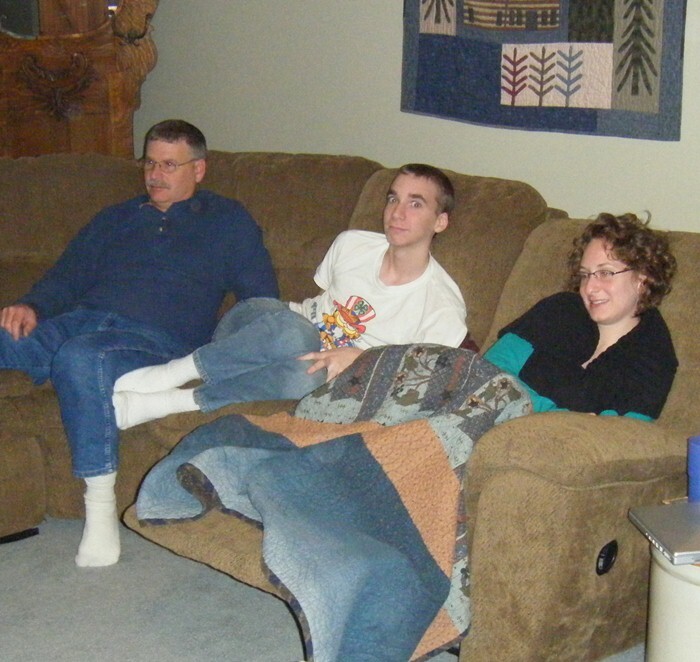 On Thursday, we watched about 4 movies in various stages of togetherness. Phil & K are the die-hards. I added a nap during one (or was that 2?) and JP checks in online often. I grabbed the camera for this shot as Nina had just snuggled her little (ha!) head up to K at the corner of the couch. However, Nina walked away as soon as I got out the camera. Seems she isn’t the only one not in favor of pictures…. I sort of headed to bed early as K & I had early alarms set for shopping!! As the usual routine, I woke up before the alarm! Argh!! Finally at 3, I got out of bed and started the day. K also awoke early so we were about 15 mins ahead of schedule by the time we left the house at 4:15 a.m.!! An hour drive had us at Target at 5:15. They had opened at 4 and the parking lot was packed! Once we were inside we realized why the parking lot was so full… NO ONE could leave! 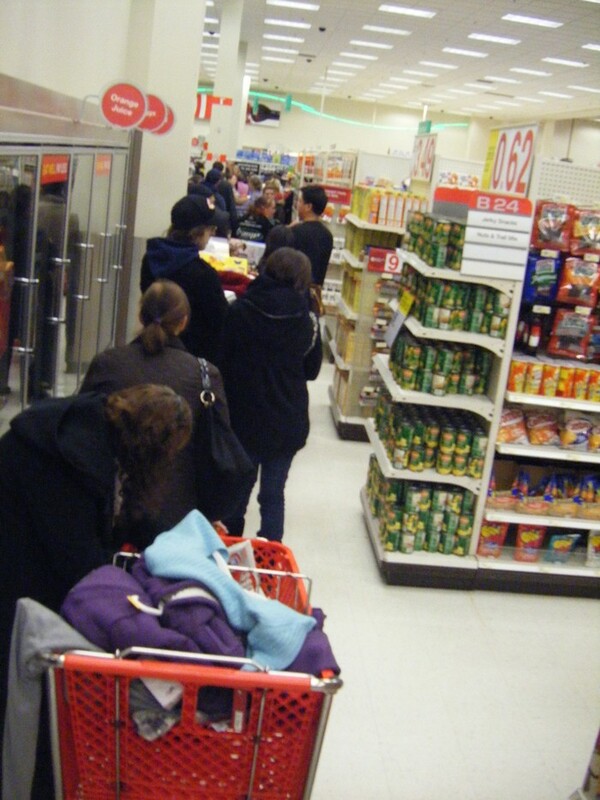 The check-out line snaked around the whole store midst all the main aisles. Seriously! There really was no way to wander & browse so we just aimed for the things on my list: sheet sets for both kids –700 count damask for $30 each!! :), sweatshirts for JP for $5 each, nice shirts for JP for $10 each, and a new star for our Christmas tree. The star wasn’t on sale… does Target match a sale price within 14 days like Shopko? I’ll be checking! We found a line on the far wall that ended at the pharmacy check-outs so planted ourselves there. A great choice we would learn. Knowing we’d be here a bit, K headed to Shoe Carnival for a deal for her feet… however, they didn’t have any! 😦 She made a stop at Old Navy and found 2 sweaters. I had only moved a bit when she returned. Meanwhile, I snapped a pix for you. And I studied the foods on the end-caps. Did you know they make Goldfish in S’More flavor? Have you had them???? Soon 2 young moms were in line behind me and we chatted off & on. They had an overflowing cart to share (we never got one) and were exhausted! I asked when they had started and they said 9:30… last night!! Argh! They discussed their lists and had at least 2 more stops to make yet. :yawn: They had already waited in the main lines about 1 hour and then found “our” line. I’m so glad we only got in this hidden pharmacy line! We were in line about 40 mins and then checked out and on our way to the next stop. The crowd there was a bit unnerving to K who has more of her father’s genes in this regard. I wasn’t in a hurry and not after any electronics so all was well. We headed to Lowe’s next around 6:25 a.m. Parking places, carts to use, and no crowds! So empty the same worker asked us 3 times how we were doing!! LOL!! We got a new Christmas tree and a few misc items as well. A bit after 9, I got my thread and we headed home. When we got home, Phil had just come in for breakfast as his hog truck was over an hour late. K went straight to bed and I tried to stay up until noon but it just wasn’t going to happen. Naps were only slightly sufficient but another lunch and then early supper revived us enough. K headed home and made good time with not much traffic struggles. I did a lot of cooking on Wednesday to make Thursday a bit easier. On Wednesday, I baked butternut squash and made the mashed potatoes. JP had peeled the potatoes the night before so it helped give me a better start on Weds. Later in the day I made baked spinach but that was just to go with supper. I baked a fresh batch of bread. On Thursday, we first got the turkey in the oven. Thankfully it was nearly thawed as many years I’ve dealt with a frozen bird! 😦 It was just 13# so not so much to man-handle. K helped make our version of Panera’s Greek Salad. That is JP’s usual choice whenever he is there. K cleaned and tore up a large bowl of 3 kinds of lettuce. We had sliced red onion, kalamata olives, diced cucumbers, and feta cheese in bowls so everyone could add whichever toppings they liked best. I made a recipe for “their” dressing and it mixed up so much better than last year’s version! K had the great idea to make croutons! She cubed some of the fresh bread from the day before and we toasted it in the oven. The turkey didn’t mind sharing the heat. The croutons turned out sooo very yummy as after toasting we then browned them up in a skillet with butter & garlic infused olive oil which we did ourselves and some herbs. I made a pan of brocolli & cauliflower with cheese sauce. 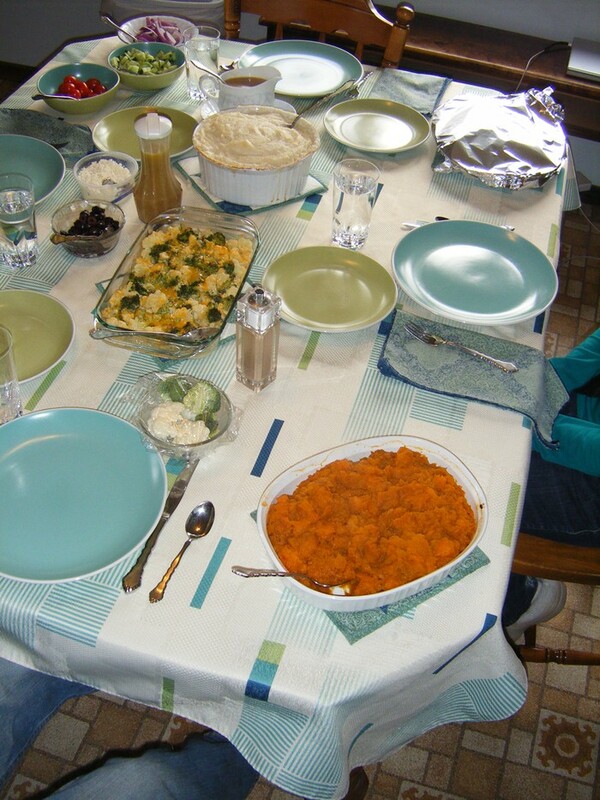 After the turkey came out of the oven, we put in the veggies, the squash, and the potatoes to get them all warmed up. The gravy I had made last week was heating on the stove. I only got one quick chance at a picture as everyone was hungry when it was finally ready. Phil voted (alone) to remove the candles as the table was too full. It was a yummy meal and we’ve been enjoying the leftovers! Phil wasn’t too full for pie so had his piece of Peach Berry Pie right after lunch. My sliver was all I needed to just get a taste. K & JP enjoyed pie for an afternoon snack. K packed a few boxes of leftovers to take home as we cleaned up the table. This morning I made turkey tettrazzini for the men from the rest of the turkey. I have 3 meals in the freezer for them. Only a bit of squash & the salad remain but will vanish in a few more meals. And certainly nothing blog-worthy to share lately. I made curtains for my neighbor over the weekend. I took my camera when I delivered them but she was going to have her husband help hang the rods. She called back a few hours later and LOVES the curtains. They are for her basement windows so just my skill level. She has done a KNOCK-OUT job on the basement. I’m sure their house is 100 yrs old so you can imagine the basement style of that time. She put bright white cement paint on the walls. Then an amazing epoxy paint on the floor. Their son installed $200 worth of fluorescent lights. She has hung “vintage” laundry signs around her laundry area and put in a new tub-style sink. She has made a scrapbook corner w/ a peg-board covering a section of rough wall. It is really stunning! I hope I get to see the curtains sometime. It is so good to see the hope for a basement. I’m inspired and eager to get to painting the walls & floor of my own but only 34 y/o basement. 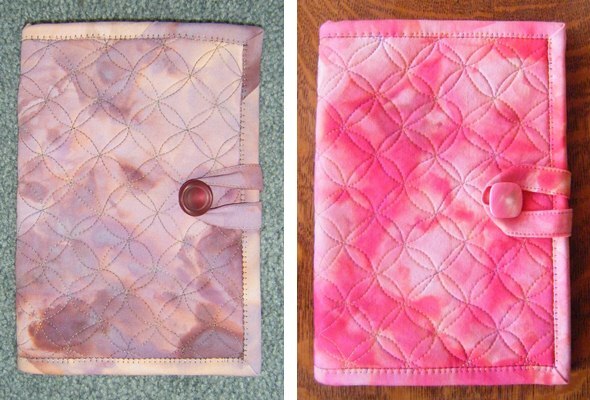 I made 2 Kindle Kovers and have them listed on my etsy site. The link is on the right side bar or click HERE. I’m working on a few more quilting projects as well as getting food planned and purchased for Thanksgiving. 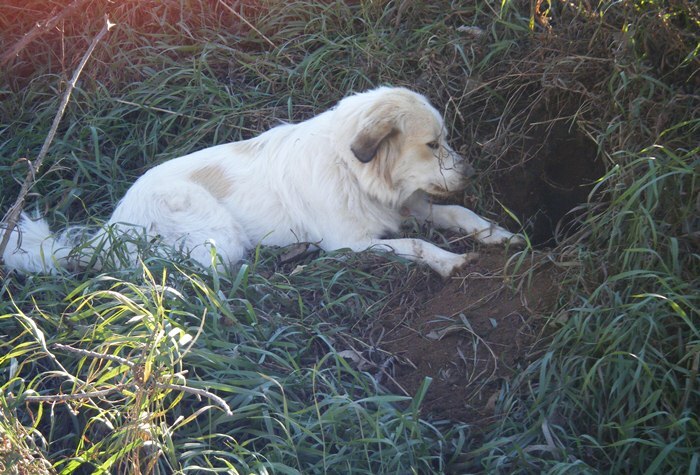 And on one morning, Phil & I got caught up on the bookkeeping and no one died in the effort! 😉 I usually do the week’s worth of checks on Monday morning but for a few months, I’ve let the credit card bills go unrecorded since they are such a hassle. Phil helped with the sorting and I got it all input to the computer. Our mail today consitested of a Chevrolet magazine (boring!! We have a Chevy, GMC, Dodge, & Ford here. Not partial to anyone! ), a Harry & David catalog, and this collection…. ‘Tis the season to be shopping, I guess. They all hit the trash. Along with the 3 we got yesterday. And the ?? we got last week. Our guild doesn’t meet in December so we have a Christmas potluck for our November meeting. I arrived purposely late for the potluck after eating at home. 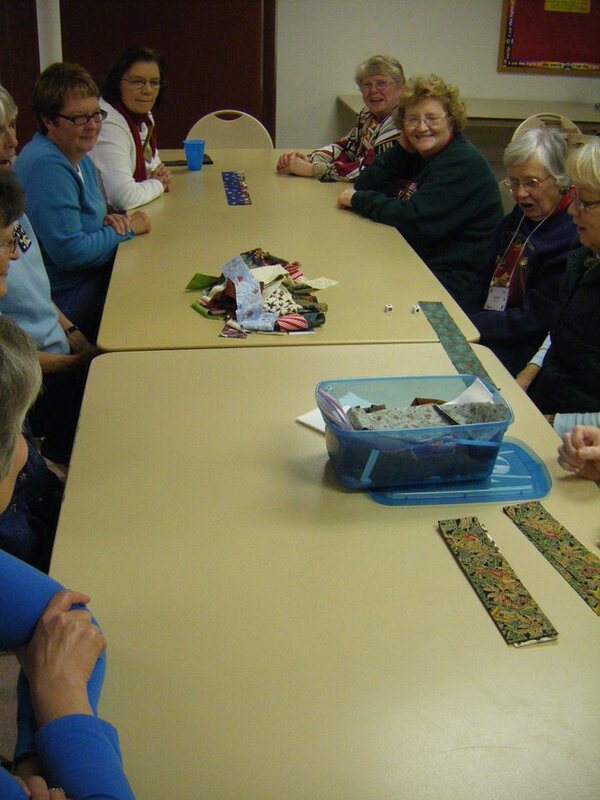 After the potluck, we played “Left, Center, Right” with 2 1/2″ strips of fabric. We had each taken 6 strips of suggested Christmas prints. Each round was played with 3 strips and all 3 groups chose to play both rounds. It was fun and a new thing to do while getting to know some others in the group. 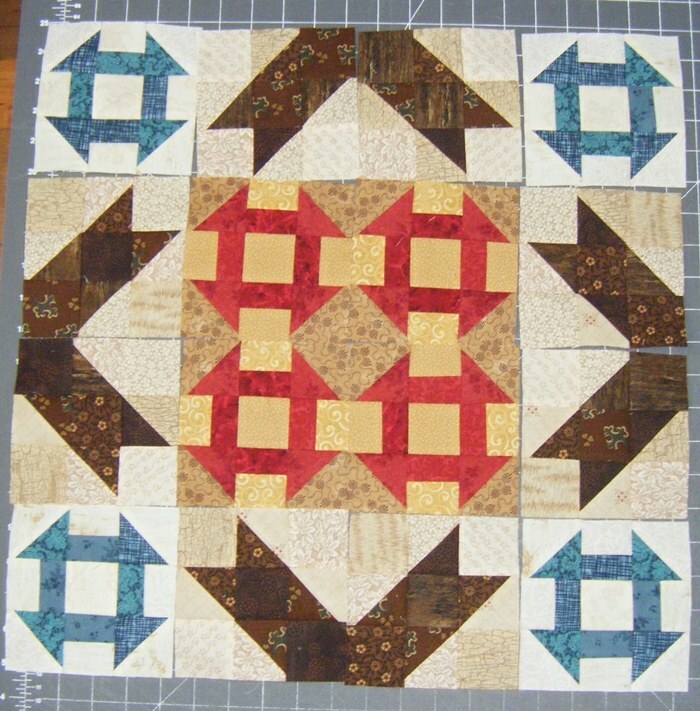 At noon on Monday, I finished my round robin border for the month. Whew!! I’m usually an early person but this one slipped by and I didn’t start it until last week. Then I was gone for most of 3 days! 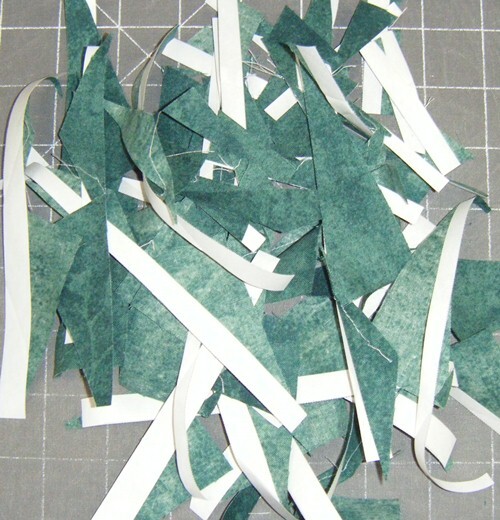 I did paper-piecing ~ my way! ~ and here are some trimmings. 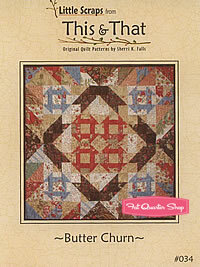 This November border was Quilter’s Choice but not squares from the month before or appliqué from next month. It was sort of like Yahoo!! – no rules but Ack! – no guidelines!! 🙂 I wish I could take a peek at the others each month. I don’t go in a group to guild so don’t get the fun of sharing in the car like others do. 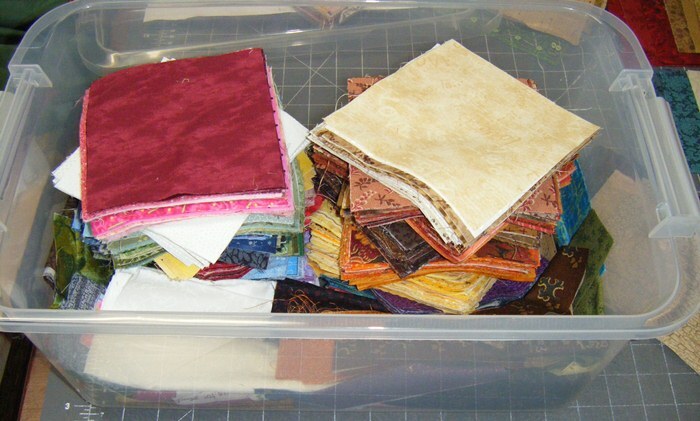 I’ll need advice for my next Round Robin quilt. Thankfully it isn’t due until January but…. it is appliqué, and I’m not sure of what design to use. 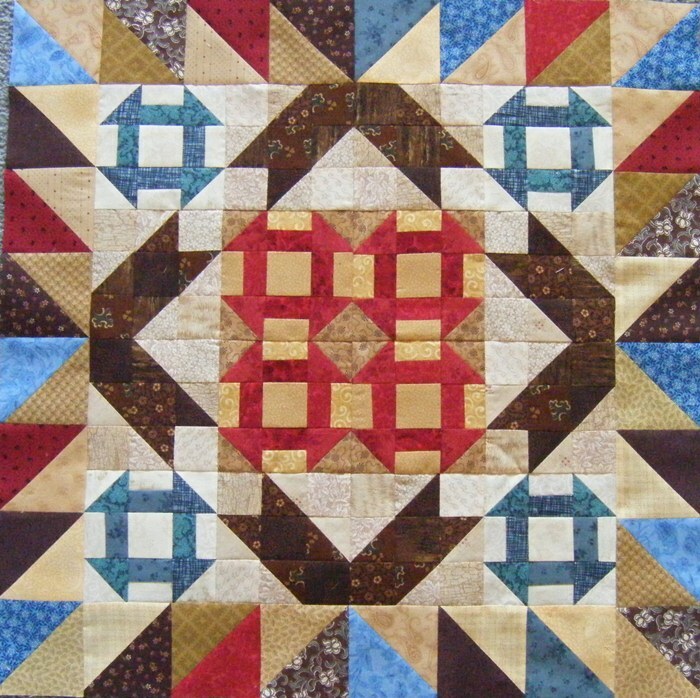 Gorgeous quilt tho!! Monday, November 15th, was my 5th year anniversary of reversing my fibromyalgia with guaifenesin. HERE is the website with info. 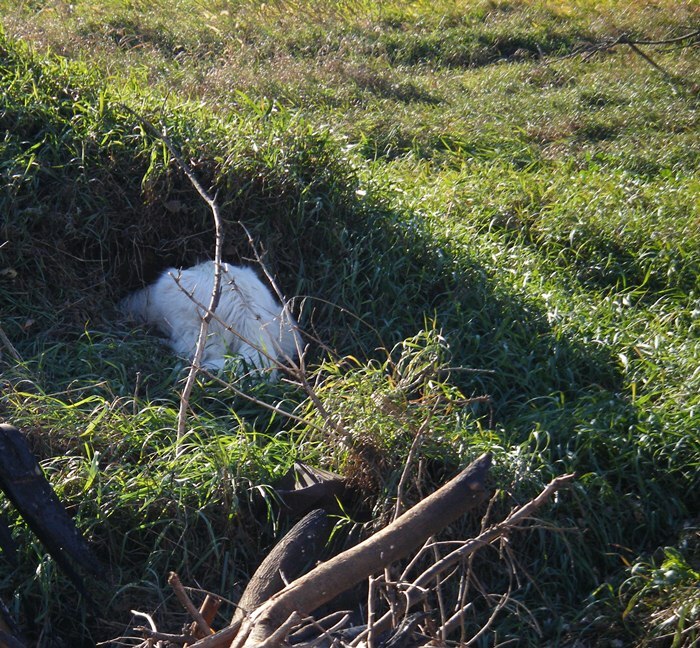 If you read very far back in my blog, you know I don’t let much grass grow under me. I have so much to do and seriously there aren’t enough hours in a day. 🙂 A far, far, cry from my life 5 yrs ago. That was sad. I was in my early 40’s and we were looking to buy a wheelchair for me. We had borrowed one for our little vacation of sorts that summer of 2005 so I could at least go with the others. But it was old and not my size and just cumbersome. I had to use the store wheelchair at Target & such places. 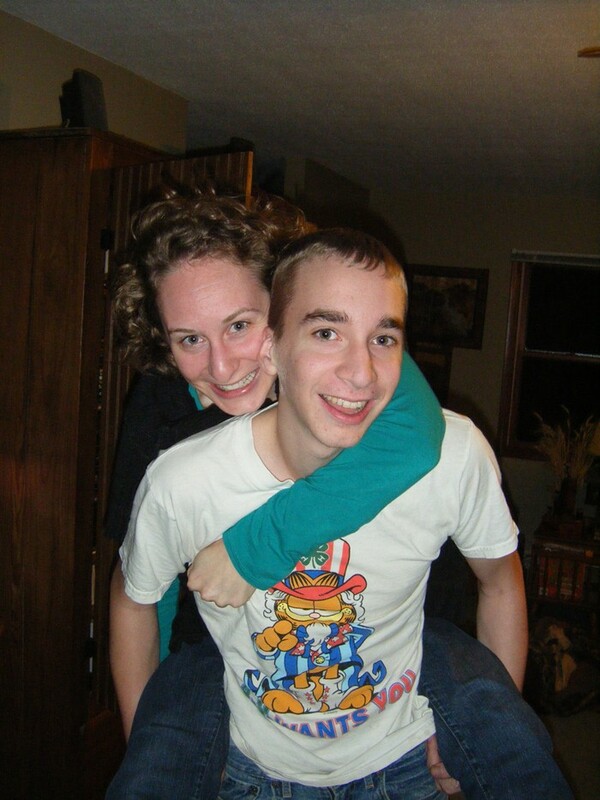 The kids would argue over who got to push me. Now, that is a sad place to be! But my legs were like cement and they didn’t move. I had fatigue that required 2 naps a day and I slept all night as well. If I did awaken during the night, it was too hard to get up and move to the living room couch so Phil got me a small TV for the bedroom that I could watch during the night. I wasn’t able to walk through the grocery store so most of the time K got our groceries after her job in that town. She had usually planned the meals and made the grocery list too as even those jobs had become too difficult for me. The guaifenesin treatment is a slow process and one that the patient has to take responsiblitly for following. There are rules to follow and if you don’t want to watch the ingredients in products you use on your skin or brush your teeth with then you set yourself up for failure right away. But if you choose to be salicylate-free and follow the dosing step-ups as directed on the website, you will get better. It is so amazing! I only write occasionally about my Fibromyalgia because it doesn’t affect much of my life anymore. But if you click on the Fibromyalgia category on the right side bar, you’ll find a few other blog posts on it. My hardest thing is the eating. About 40% of those with Fibromyalgia are hypoglycemic and I am one of them. I follow the HG eating plan that Dr. Paul St. Amand has written and tested. I keep mostly to the strict side but can have some of the vegetables on the liberal side. I also have a piece of sugar-free whole grain bread occasionally for a treat. When I cheat on the eating plan (including eating chicken at a restaurant as they soak it in sugar solution…. dumb! ), I get an upset stomach, a headache follows a bit later, and the next day I’m fatigued and sluggish. It is impossible for me to find a safe meal out to eat and I miss that. I’m sick of cooking but I have to do it. There aren’t short-cuts and I have other things I’d rather be doing than spending time in my kitchen. I’m so thankful that I decided to try the guai 5 years ago when I read about it. I had tried so many other “cures” and come up dry and poorer every time. This works! While I do take a dye-free formula via a prescription, the medicine is available over the counter! No one is making money off of me following this protocol except the store where I chose to buy my guai. There are no paybacks or multi-level marketing at play here. Those who wrote the treatment program have fibromyalgia themselves. They know the pain. The fatigue. The fog. They’ve been in our shoes! I now help others get started on the guai protocol. I’ve learned that just because someone has FM and asks about it doesn’t mean they are going to follow it. I offer information and help and more help if they ask. I help because I have my life back. I had to do this alone and learn it myself midst the fog. I’m very willing to help others get started. My sadness with the FM is knowing others that are diagnosed with the disease and know about the treatment and how much I’ve improved and still refuse to look into it. Why? Do you like the pain? Is there attention there? Don’t you want your mind back? Your energy? Your strength? You can have it back with guai. It takes time but it works. You didn’t get this sick overnight and you won’t be better overnight. But for me, my 42 years of building up are nearly clear in just 5 years. What a blessing! I’ve come to the point of being thankful that my disease is fibromyalgia. I have been able to reverse it and get my life back! That doesn’t happen with so many of the similar diseases I was tested for in the early days. I don’t have fancy pictures to go with this post so thanks for reading along if you’ve come this far. 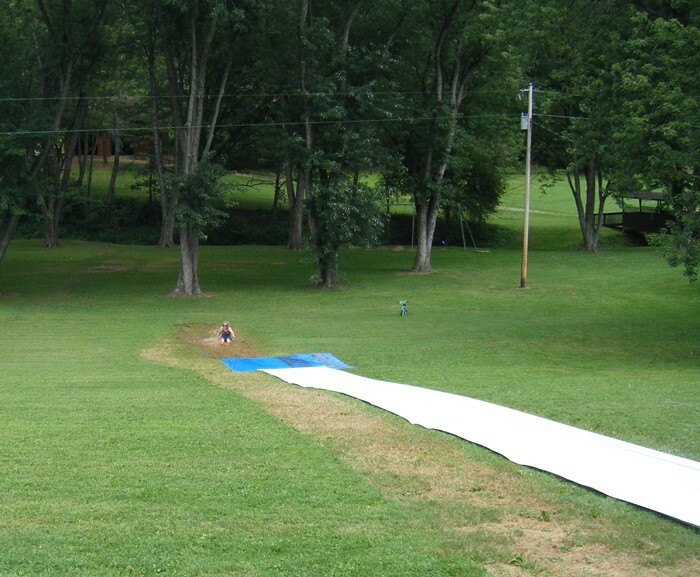 This is me ending my ride on the slip & slide! In the mud! Guai works! If you have fibromyalgia, what are you waiting for?